The ‘new operation for vaginal fistula’ was that devised by James Marion Sims in the 1840s. It was a major breakthrough, a surgical treatment for an uncomfortable and embarrassing condition in which urine escapes via an anomalous communication between the bladder and the vaginal cavity. ‘Catheterism of the lungs’ was pioneered by the Vermont-born specialist Horace Green. It was a controversial treatment for tuberculosis which involved injecting silver nitrate directly into the lungs, using a rubber catheter passed down the patient’s throat. Both were emblematic of a new spirit of surgical adventure, and perceived as major advances. As you’ve probably worked out, Dr Gotham is drawing such comparisons ironically. The government of the United States has immortalized its history by the issue of letters patent, securing to the inventor the exclusive right for fourteen years, of using a “Trap for Tapeworm,” a description and engraving of which are given in vol. i. for 1854, of the Patent Office Reports. 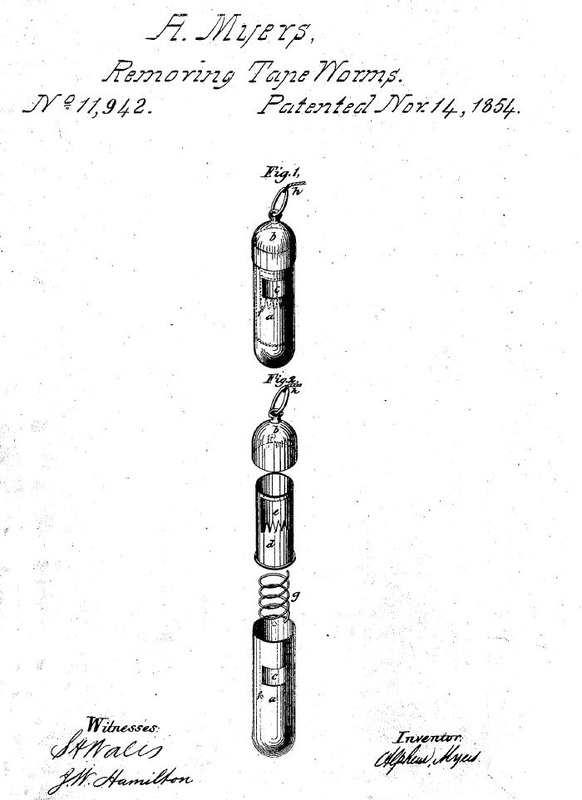 Indeed, the original patent for the tapeworm trap still exists. It was filed by Alpheus Myers, a doctor from Logansport, Indiana. Strangely, he patented not just the device but the operation for which it was designed – thus ensuring that he would be the only person in the country allowed to use it. This is not a particularly clever thing to do if your aim is to sell your invention to lots of other people. The tape-worm trap is a very small hollow tube of gold so arranged as to contain a small piece of cheese for a bait. The patient, after a fast of four or five days, is ordered to swallow the trap, with a string attached. It is claimed by the inventor that after a long-continued fast, the worm comes up into the stomach, and will then greedily seize the cheese, be caught in the trap, and can be easily pulled out. The cord is fastened to some conspicuous place about the patient, who is left to his ease from six to twelve hours, and during this time the worm will have seized the bait and have been caught by the head or neck. The capture of the worm will either be felt by the patient or ascertained by the motion which will be visible in the cord. The patient should rest for a few hours after the capture, and then by a gentle pulling at the cord the trap and worm will, with ease and perfect safety, be withdrawn. Imagine to yourself the satisfaction with which a man could thus sit down and fish in his own room, without even the accompanying tub of water; the patience and complacency with which, after waiting from six to twelve hours for a bite, he would then play his prisoner some hours more before landing him! Does not Mr Alpheus Myers have good reason to believe that the shade of Izaac Walton looks down upon him in anger for this innovation upon the piscatorial art? The same article also claims that ‘Dr Myers, not long since, removed one fifty feet in length from a patient, who, since then, has had a new lease of life.’ A likely story. My object in drawing the attention of your readers to it, is simply to expose the shameful ignorance, not of Alpheus Myers, but of the officers of our government, who would take money from a man for so gross an absurdity as this. There are physicians connected with the Patent Office, men whose names stand well before the country, and how they or the commissioner, could have allowed the seal of the office to be affixed to such a document… for such a monstrously ridiculous contrivance, surpasses all comprehension. Apropos to tapeworm: I have lately seen and examined a specimen of it, 56 inches long, expelled from a patient in the New York Hospital by an infusion of pumpkin seed. Eight ounces of boiling water added to two ounces of bruised seed, was taken in one dose, at 12 o’clock, followed in three hours by an ounce of castor oil, by which the worm was expelled about 6 o’clock, with its head entire, and alive. do tapeworms even eat cheese? No,they feed on the nutrients in the intestine..they also have no access to cheese, being as rhey live in the intestinal tract, Cheese has long since ceased being cheese..